Busy with revisions, so here’s a pic from Monday morning. 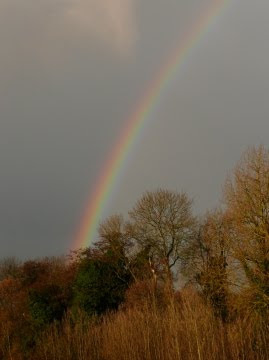 There was a brighter rainbow on the actual school run, but I didn't have the camera on me - and I haven't yet installed the software to transfer files between my new phone and PC, so I can't post that pic yet. But, while the computer was booting up, I was making myself a cup of tea... and spotted this from the kitchen window. This morning the moon was obvously full, but this morning it was seemed huge and very bright, quite magical. Any ideas what causes it to look like that at times? Really sorry to read about your dad,I do know what you are going through and how heartbreaking it is. You have just proved my husband WRONG...we saw lots of rainbows in Cornwall last week, and I kept badgering him to take a pic but he said a photo wouldn't come out. Yours is great! Olivia - we's so lucky with rainbows here in Norfolk. And thanks for the hugs. Lacey - do you really not get many rainbows down under?